Skip the trip to the mall to find a new tie and go the original route this June with a sweet handmade gift for dad. He'll love the sentiment of a card or treasure made by his own kiddos, and your kids will love getting involved in making his day special. Any of these 16 ideas are perfect for reminding dad why he's so important to you and your family! Do your kids and their dad often play a game of catch? 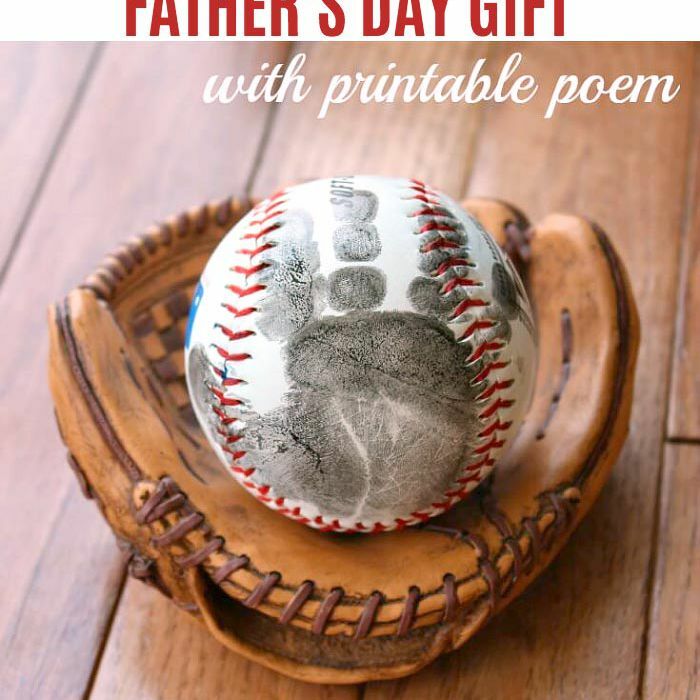 Help your little ones give dad something to remember all those afternoons in the backyard with this adorable handprint baseball craft! A heartfelt and creative craft to remind dad of all the good times had and the good times to come! Let your little lego-lover take the lead on this one. This printable makes it oh-so-easy to give dad a sweet book of personal poems and drawings! The best way to showcase his creative kids. Does dad have a bit of a sweet tooth? Give him a cute personalized mason jar full of his favorite candy or cookies! An easy paper craft from one of our favorite blogs: Use a school photo or take a new one for the surprise under the owl wings. One, two, three, blast off–with your love for dad! Show him how you feel with this cute rocket ship card from his little astronaut. A punny gift for a dad who loves to laugh. Give dad a chuckle and remind him what he means to you with this easy craft. Have a grill master for a father? Help the kids make this card and maybe gift it with a new pair of grill-gloves or a bottle of barbecue sauce. Shrinky dinks are a totally underrated crafting tool. Make dad a key chain with mini charms of his own kids' handprints! An easy gift dad can actually wear! Let your kids go crazy with the crayons and fold their art up into a cute paper bowtie, easily attached to an elastic band for easy wearing! This easy craft can be used for years and years to come. Make a personalized mug with some stickers, sharpies, and a plain white crafting mug. This creative card is a little off the beaten path and totally perfect for displaying on the mantle or at an office desk! Decorate these little stand-up card rolls with photos, drawings, and stickers! Remind dad what a catch he is with this sweet handprint fish card. Bonus points for creative and cute catch-phrases! Is dad a real cowboy, or maybe just a lover of Westerns? Craft a sweet toothpick holder that shows it! An easy printable and cute photo idea to remind dad how much you care about him. Personalize to your own taste and get the whole family involved in this one! This card is perfect to do with your especially little ones, just make a paint print of your kid's feet, and secretly do the same with one of dad's shoes (just be sure to use washable paint! ).